I am beyond addicted to Instagram at the moment so I thought it was only right to share with you some of my favourite feeds, I have already done a round up of my top 6 accounts here. Therefore I have updated my favourite accounts to share with you. 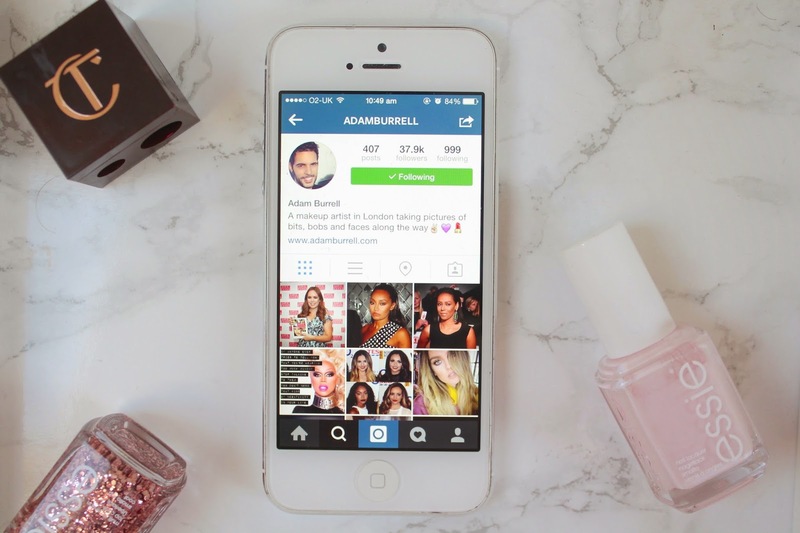 Adam Burrell// Adam is a makeup artist for the stars. Adam always shares his set up on shoots and I just love to have a look at what he’s got in his kit, he often shares his recent looks on the likes of little mix, Mel B, Tanya Burr etc. He is also an ambassador for Barry M cosmetics and I love watching his tutorials on their youtube channel. I am also in need of one of his hand-made lip palettes, they are dreamy. If you don’t already follow him, I suggest you do. Ella Grace Denton// Ella runs a blog called weneedtolivemore.com where she posts outfit of the week, and amazing healthy recipes. My favourite go-to recipe from her blog at the minute has to be her pancakes. I love me some pancakes. Her instagram account however is mesmerising, she takes stunning photographs which I adore. She often posts little quotes which are so inspirational, I just really enjoy scrolling through her feed, always cheers me up. Amelia Liana// Amelia is a blogger and vlogger who lives in London. She always has pretty pictures whether that be of new beauty releases, her recent trips abroad or of her super cute doggy Duke. If you don’t already follow Amelia I highly recommend you do. Her blog and youtube channel are also one of my favourites http://amelialiana.com. Alix (ICovetThee)// Alix is also a beauty blogger and vlogger. If theres one beauty account that you follow I would recommend it be ICovetThee. I love looking at her most recent Space NK purchases, she always knows which filter to put onto her photographs, love her account. Victoria (InTheFrow)// I have serious hair envy of Victoria, her hair is the perfect shade of purple. Victoria posts outfit photographs, foodie images and beauty products, she has also just moved down to London and I love looking at her adventures in LDN.